After more than a month of state-ordered stasis, Seattle’s tunnel boring machine is moving forward again. The Washington State Department of Transportation on Tuesday allowed Seattle Tunnel Partners to start moving the Bertha tunnel-boring machine forward another 160 feet, while the state closely monitors the project. 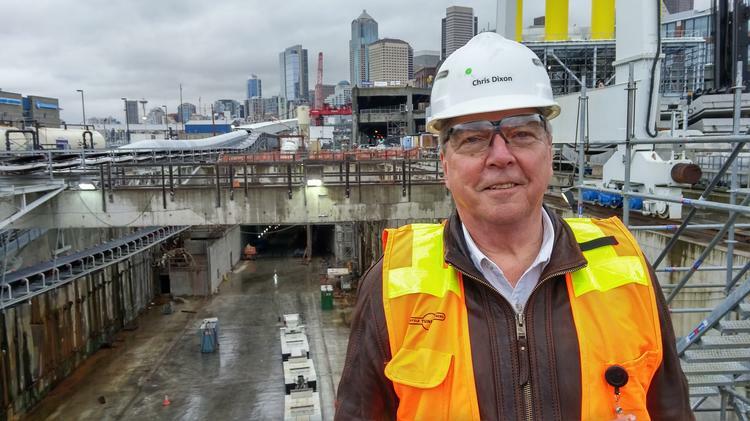 Seattle Tunnel Partners Project Manager Chris Dixon, with the south entrance of the downtown tunnel behind him. Under new rules, the state is requiring STP to increase its quality controls. The contractor must have people monitoring key positions in the tunnel boring machine and provide daily updates. Daily meetings reviewing progress are to include representatives from the department of transportation and the contractor. After a series of fits and starts for the boring machine – which was initially scheduled to be done digging the Highway 99 tunnel to replace the Alaskan Way Viaduct last year – Gov. Jay Inslee ordered tunneling halted Jan. 14 after a sinkhole appeared near where the machine was burrowing. While STP quickly filled in the hole, state authorities were concerned enough to order the contractor to stop the machine before it starts tunneling under the Alaskan Way Viaduct, and then downtown Seattle. The machine had started tunneling again Jan. 7, after being stuck for more than two years underground just west of Pioneer Square. STP had to rebuild the front end of the machine with new bearings and bearing seals after the previous parts were damaged before drilling could proceed. If boring proceeds satisfactorily, STP will be allowed to continue boring another 100 feet to a planned maintenance stop. There crews will perform final maintenance before the machine bores under the viaduct. The intent of the 1.7-mile tunnel, at 58 feet in diameter the largest in the world, is to create a highway under Seattle to replace the elevated viaduct. When completed, the tunnel will provide room for two lanes north and two lanes south. The aging viaduct is considered seismically vulnerable, and the state chose the tunnel option as a way to replace it without unduly disrupting viaduct traffic during construction, and to connect Seattle’s waterfront to downtown. It's certainly an exciting time for fans of Los Angeles public transportation. The Measure R transit tax-fueled expansion of Metro's rail lines is already giving more and more Angelenos the ability to ditch their cars and zoom from neighborhood to neighborhood by train, and Metro has many more plans to add new rail lines throughout the city over the next decade (with several underway already). But all that has eluded the city of West Hollywood. While some Westside neighborhoods will soon see trains traverse their streets for the first time in decades, no future rail expansion plans come anywhere close to the little city. WeHo tried to get an extension for themselves when Metro was expanding westward, but the transit agency balked at the high cost. Former LA Mayor Antonio Villaraigosa told WeHo officials to sit tight then, because they were "next in line," but WeHo began to mobilize just in case that promise went unfulfilled. In 2015, the West Hollywood City Council launched the West Hollywood Advocates for Metro Rail (aka WHAM) as part of a campaign to win grassroots support for a Metro rail extension into the city. To get a West Hollywood rail line off the ground, WHAM needs Metro to include it as part of its Expenditure Plan when LA votes on it in November. That means selling it to the public, and quickly. WHAM volunteers have been getting the word out in WeHo, as well as engaging neighborhoods that would eventually be connected by the line. They've already gathered about 3,000 signatures from supporters of a WeHo rail extension, reports Los Angeles magazine. WHAM wants Metro to expand the upcoming Crenshaw Line (already under construction) northward to West Hollywood, connecting the neighborhood not only to Metro's system, but also directly to LAX. A feasibility study is needed to determine the exact route a train line would take to WeHo, but WHAM is hoping for a route that spans from San Vincente to Santa Monica Boulevard. The train would run completely underground, making it's way through West Hollywood before connecting with the Red Line at Hollywood and Highland. On the fiscal side of things, the city council is still grappling with how to cover the immense cost of this potential project—expanding the Crenshaw Line to West Hollywood comes with a pricetag of at least $4.5 billion. WeHo officials are currently mulling the idea of a tax increase to raise revenue for the project. WeHo Councilmember John Duran has a scheme to push Metro's hand too. He wants to get a sales tax increase on the ballot by June to get the jump on the Metro tax increase that's expected to be on LA's November ballot. If WeHo passes a sales tax increase that pushes it closer to California's cap of 10 percent, it would limit the amount of tax revenue Metro could get from WeHo if their November ballot measure passes. Duran says a WeHo tax increase would make Metro more likely to negotiate with West Hollywood over rail expansion in exchange for their tax revenues. According to Duran, WeHo felt burned by the passage of Measure R in 2008, which taxed West Hollywood like every other city in the county, but did not provide them with any transit improvements. Duran thinks WeHo's new tax plan would send a message to the county that "we don’t want to be forgotten again." Metro has been keeping tabs on WHAM's progress. Lisa Belsanti, WeHo communication manager and WHAM member, tells Los Angeles mag that Metro officials have attended WHAM outreach events, and even Metro Board Chair John Fasana has been spotted. WHAM could be a powerful ally for Metro as they attempt to get Measure R's sequel passed in the November election. If a WeHo transit line is in Metro's future plans, WHAM says it will help campaign for the ballot initiative.